An online presence is crucial for any business in this current age, even construction companies. If you have a well-maintained website, with details of your work and past projects, it increases your demands in the market. Irrespective of the fact that you run a small or large size company, a website is of immense help. 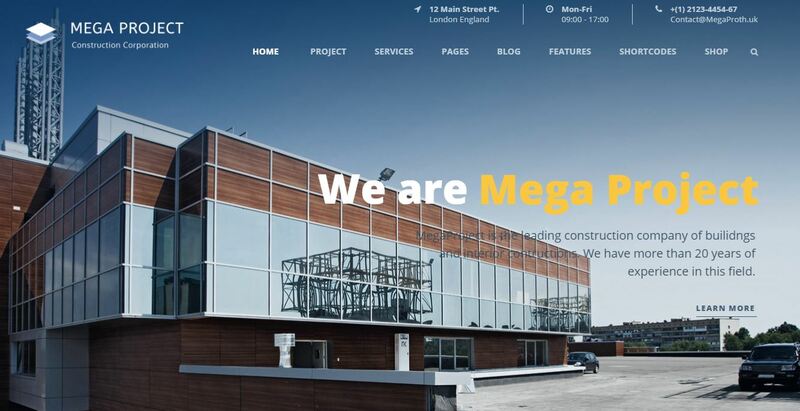 Here we have shortlisted some best Construction WordPress themes with the right amount of features and spot on design style to help you maintain your site and attract more clients. Multipurpose Construction and Landscape WordPress theme. Construction is a business theme designed specifically for construction, building companies and those that offer building services. 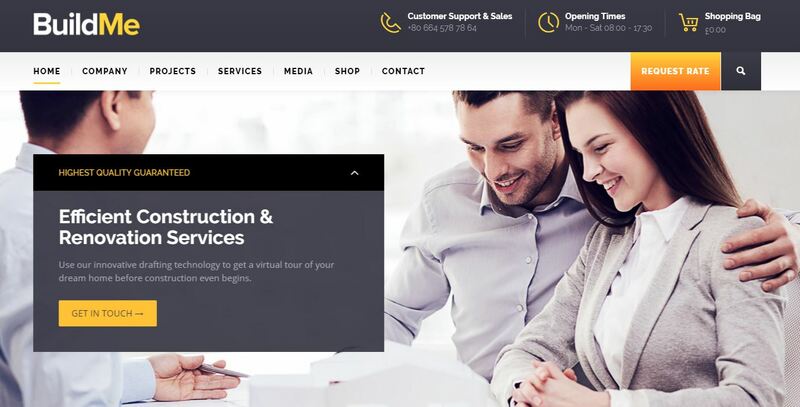 Constructo is focused on building pages in construction company niches. WordPress theme best suitable for construction, building companies, renovation and remodeling contractor services. Structure is the responsive WordPress theme for building service company such as construction, engineering, architecture website. The theme is built for Building Services, Architecture, Engineering, Cleaning Service and other Construction related services. The theme is built specifically for the construction industry. 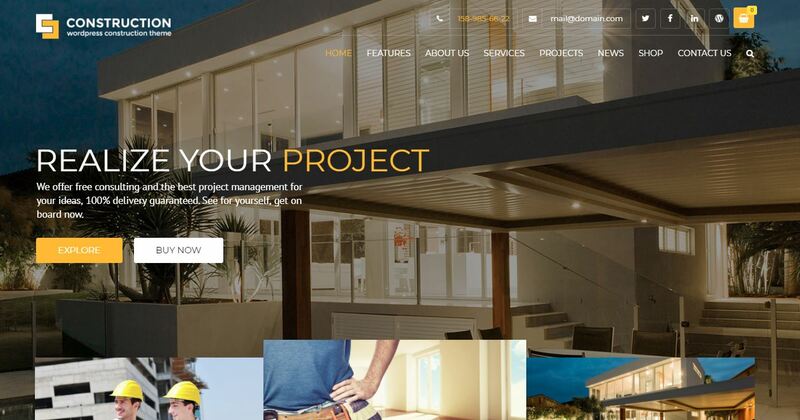 Easy-to-customize and fully featured Construction Company WordPress theme built using HTML5. Clean responsive WordPress theme designed for Construction, Building Website, Architecture, Engineering website and more. User friendly construction theme, which can be used for architecture template and home design websites. 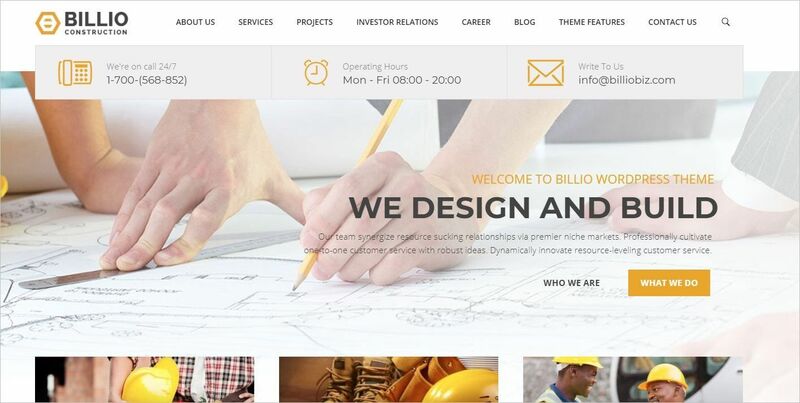 Billio is a company WordPress theme designed for companies specializing in manufacturing, heavy equipment, construction, and spare parts sales. 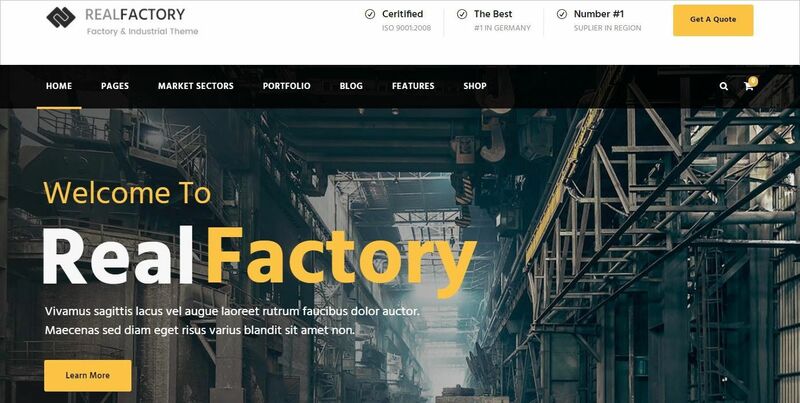 Real Factory is a WordPress theme for Factory, Industrial, Construction, Rail Business, Airplane, Oil and Gas Business website, etc. 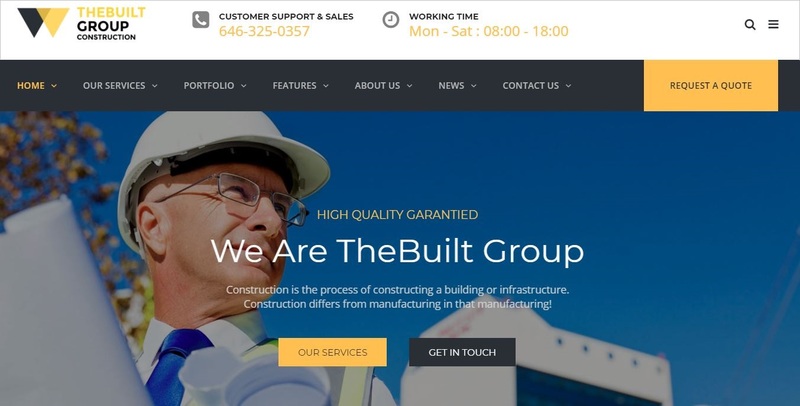 We Build is the perfect Premium Construction WordPress theme. Designed specifically for Construction Companies, Building Services, Architecture, Interior Design, Renovation Services and many more. ReConstruction is a construction and building WordPress theme focused on construction, building, plumbing, heating, painting, etc. It offers customizable quote calculator, unlimited project portfolio layouts based on grid pattern, three different tile / grid blog layouts, page transitions and distinctive typography. WordPress theme designed specially for construction / building busines and those that offer building services. It is fully Responsive, Retina Ready and Easy to customize. BuildMe is a sleek and elegant WordPress business theme best suited for construction company, architecture firm and other related business. 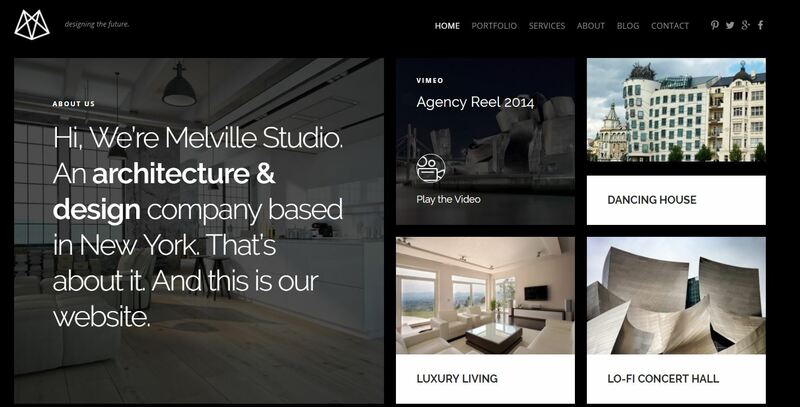 TheBuilt is a Premium Corporate, Construction, Architecture and Business WordPress theme. Contains 20+ Header Styles combinations, Visual Frontend/Backend Page Builder, Revolution Slider with pre-made premium sliders, etc. Construction and Building WordPress theme. It conatins Drag-n-drop page builder, 10 Header styles, 15+ page loader animations, and more. The theme is focused on building websites for construction companies. Includes Visual Composer, Revolution slider, WooCommerce support and an advanced admin panel. Also supports RTL Language. Clean and retina ready WordPress construction and business theme. Batakoo is suitable for the construction business, engineering, architecture and the company website. Building and Renovation Services Construction Business WordPress theme. Theme built especially for Construction and Building Company. Cast is an intuitive, flexible and powerful WordPress theme, designed to suit the needs of building and construction websites. The theme includes the most popular premium plugins: Visual Composer, Revolution Slider and Essential Grid. Create almost any type of layout, using a drag and drop interface and tons of pre-built elements. 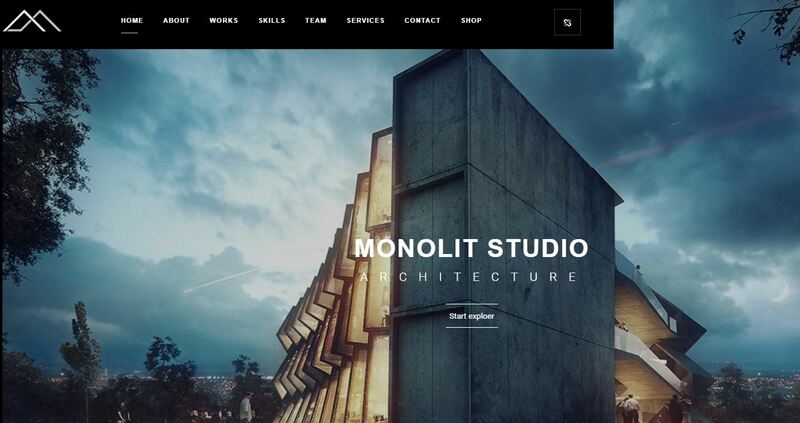 Melville is an architecture WordPress theme that is the ideal fit for an architect, construction company, interior designer and home builder. 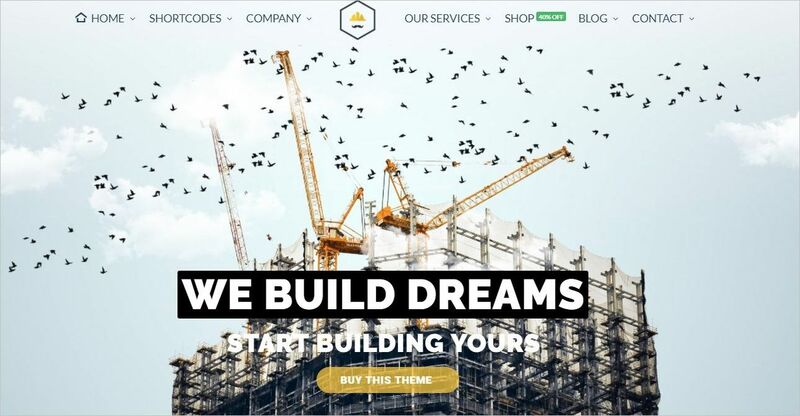 Construction WordPress theme is a business theme designed specifically for construction, building companies and those that offer building services. Powerful WordPress theme designed and developed for construction, building business websites. Hammer is bridging the gap between practical demands of the construction-related businesses and light, clean and aesthetically pleasing design. Widgets can be easily assembled with the popular drag-and-drop builder by SiteOrigin. 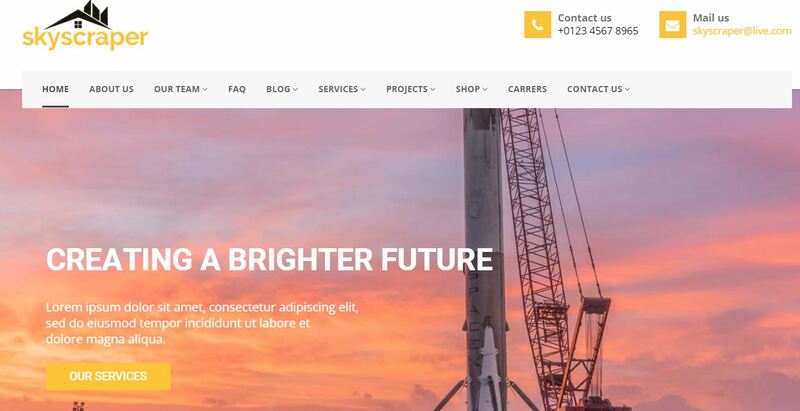 Exilor Construction gives you the power to create a unique-looking website with an easy-to-use to use Page builder and Responsive style Customizer. Construction and Building WordPress theme. Also if you have any personal favorites in the context of construction company themes that wasn’t in the list, then you can mention them in the comments too.